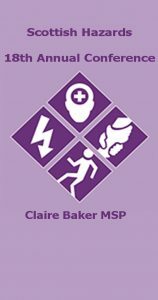 Our annual conference took place on Thursday 8 November 2018 when Claire Baker MSP launched her proposals for changes in the law of culpable homicide to ensure deaths at work can be prosecuted for involuntary homicide in the same manner as any other homicides taking place in Scotland. Patricia Findlay Co-Chair of the Fair Work Convention spoke on the strong links between good health and safety and fair work and a special recognition award was given to Jim Swan ex-union convenor at British Leyland in Bathgate for his services to the hazards movement in Scotland, the United Kingdom and Europe. 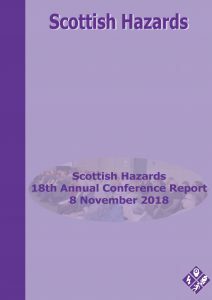 To read more about our conference click on the image to download the full report or scroll down to watch videos and view presentations from the day. 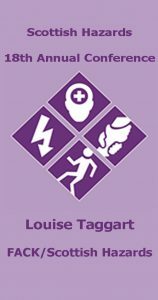 Click on images to view videos of contributions in the opening plenary from Claire Baker MSP, Patrick McGuire from Thompsons Solicitors and Louise Taggart from Families Against Corporate Killers and Scottish Hazards. 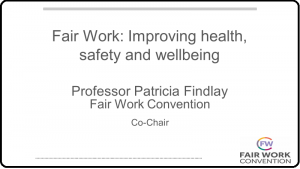 Patricia Findlay Co-Chair of the Fair Work Convention spoke of the inextricable links between fair work and health and safety outlining dimensions of fair work where good health and safety is imperative for employers to be able to demonstrate providing fulfilling, respectful and secure work. 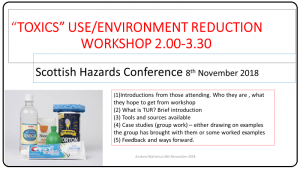 The presentations for the afternoon workshops on sexual harassment in the workplace, toxics use reduction and using Freedom of Information to drive health and safety improvement can be downloaded below by clicking on the images. Jillian Merchant from Thompsons Solicitors facilitated a workshop on sexual harassment as a workplace issue, increasing reps understanding of the health, safety and welfare impacts workers being harassed suffer and how to equip reps to support workers facing harassment. Andy Watterson spoke about toxic use reduction and how we can learn from the United States on managing the use of toxic substances out of our workplaces and communities. 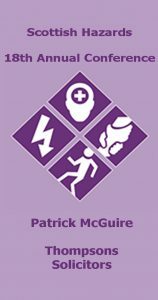 Workers are exposed to toxins on a daily basis and often the opportunities to substitute or a safer option are missed. 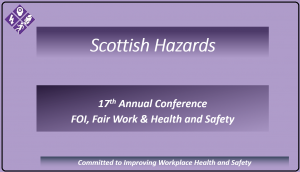 Ian Tasker from Scottish Hazards examined how trade unions and health and safety representatives can use freedom of information laws to gather evidence and develop health and safety campaign from the information received.